Teaching children to Respect Grandparents: The society in which both children and adults do not honor the elderly is doomed to eternal suffering. It is high time to halt this trend and do something to repair and harmonize the relationship between your children and their grandparents because this relationship is important and valuable for all members of the family. Communication between grandparents and grandchildren makes a big contribution to the kids’ development and helps them become rich in heart and soul. But this relationship will never be healthy if there is no respect in your family. As a parent, you should take responsibility for everything happening in your family and instill positive values in your children. If you do not know how to raise the level of respect in the grandparent-grandchild relationship, I will tell you how to do it correctly. If you have at least once noticed your kids showing disrespect to their grandparents, you should not turn a blind eye or be silent about it. It is absolutely unacceptable and there is a high probability that their disrespectful attitude will turn on you as you get older. Your parental mission is to bridge the generation gap between your kids and their grandparents. Do not wait until the situation gets out of hand. Tell your kids that it is necessary to respect and assist the elderly. No matter how busy you are, it is necessary to find time to familiarize your children with the main etiquette rules. Your efforts to teach your kids to respect their grandparents would be in vain, if you allow yourself to disrespect your elders. You are a role model for your kids. Whether you like it or not, they absorb your emotions, analyze words and repeat your behaviors. If you really want to coach your kids to be respectful toward their grandparents, but the situation does not move off dead center, you should start working on yourself as well. It is unbelievably hard to find the middle between emotional restraint and emancipation. That is why we usually run to extremes and make mistakes. If you are an extremely reserved and even shy person, then your children will find it difficult to learn how to openly express their feelings, too. If you want to create an emotional bond between your kids and their grandparents, you should overcome your insecurities first, and start expressing feelings to your parents in the presence of children. They should hear and understand that saying ‘I love you’ to a parent or grandparent is normal. Unfortunately, many modern children know almost nothing about their grandparents, great-grandparents and other members of their big families. But the only ones to blame in this gap are parents. Avoid making the same mistake. Tell your children the history of their grandparents’ long and difficult lives. If it is possible, try to back up your words with family pictures. If they are disabled or experience severe medical conditions, you should explain to your children that it is hard to fight chronic illnesses with a smile on the face. Your children should know that from time to time it is necessary to ask their grandparents how they are doing, help the grandma make her famous sugar cookies, fetch the grandpa a hammer and do many other small good deeds. These sincere steps of goodwill usually make the hearts of grandparents beat faster and let them feel that they are still well-liked and respected. Both big and small acts of kindness, performed by your children should not go unheeded because they can quickly lose interest and motivation. Start praising them today and they will remember that respectful attitude towards grandparents is a good thing. No matter how tired and exhausted you feel after a hard working day, you should never forget or refuse to read edifying fairy tales with your kids. But just reading isn’t enough because children can’t understand the message and a so-called moral of the fairy tale alone. If you want your kid to learn a lesson from these cartoons or fairy tales and become a better person, you should analyze the actions of the characters and discuss the plot of the fairy tale together with your children after reading. Look for fairy tales that describes grandparent-grandchild relationships. 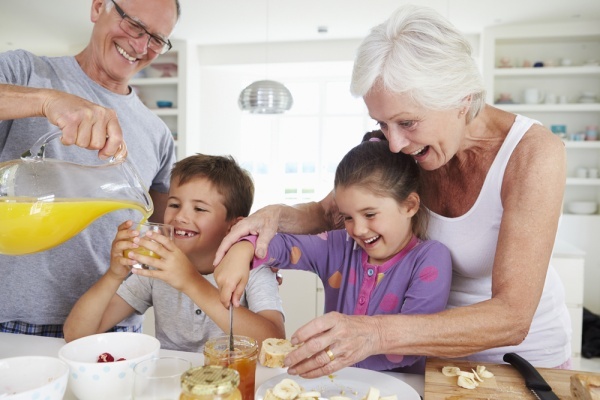 It is crucially important for both parents and children to always remember the main holidays and other important events in their grandparents’ life. As a parent, you should make it a habit of involving your kids in preparing for their grandparent’s birthday. Their active participation in this creative process and frank desire to surprise their grandparents positively will increase the significance of elder generation in their hearts. When they get older, they will start congratulating their grandparents independently. It is difficult to harmonize relationships between family members, and modern kids are so busy catching Pokemon or playing other games that they have no time for their grandparents. Start early and help your child value the family they have. Teaching Children Respect in 5 Minutes or Less!